Terri is a licensed healthcare professional who practices medicine in partnership with Lenore Sikorski, MD. She specializes in dermatology and has extensive experience treating a wide variety of skin conditions and diseases. Prior to joining the practice, Terri worked in a private dermatology practice in Bryn Mawr, Pennsylvania. Terri evaluates and treats a variety of dermatology patients. She performs medical and cosmetic dermatologic procedures such as biopsies, excisions, chemical peels and laser treatments. Terri received a BS in Biology from UCLA and then received her Master in Medical Sciences from the Yale School of Medicine. She is certified by the NCCPA (National Commission on Certification of Physician Assistants). She is a member of the American and California Academies of Physician Assistants and the Society of Dermatology Physician Assistants. Chelseah PA-C is a licensed Physician Assistant who specializes in the field of dermatology. She has treated a wide range of medical skin conditions, encompassing acne, skin cancers and various dermatological rashes. 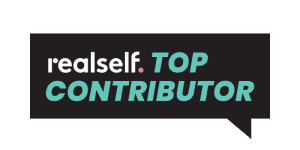 She works with each person on an individual level to help them meet their optimal skin care needs; understanding their specific skin care goals and working through their frustrations and barriers to help them reach their end goal. 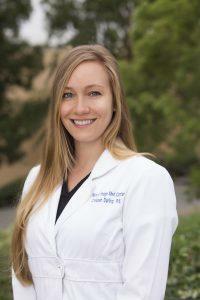 Chelseah joined our practice after working for 4 years at a dermatology clinic in Rancho Mirage, California. There she specialized in skin cancer removal as well as treatment of various dermatologic skin conditions. She also performed cosmetic injections of toxins and fillers. Chelseah is originally from Michigan, where she graduated with her B.S from Michigan State University with high honors. She then moved to California to attain her masters of Science degree at Loma Linda University in Physician Assistant Studies. She is a certified Physician Assistant who has been practicing in dermatology since graduation. She enjoys helping patients through the often-tough road of skin dilemmas so they can be happy and confident in themselves. 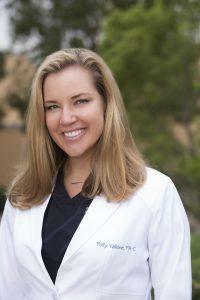 Polly Vallone, PA-C is a Certified Physician Assistant who received her degree at Stanford University. Polly completed her undergraduate degree at the University of California Santa Barbara where she majored in Biology. To maintain her certification, Polly completes over 100 continuing medical education hours every two years and takes her recertification board exam every ten years. These requirements enable her to stay current with the ever evolving practice of medicine. She treats sun-damaged skin, diagnoses and treats skin cancer, as well as an array of common dermatologic conditions such as eczema, psoriasis, rashes, warts, pigment disorders, alopecia, acne, and rosacea. She performs biopsies, excisions, C and D’s, and cryotherapy. She has a strong knowledge base of all types of lasers. 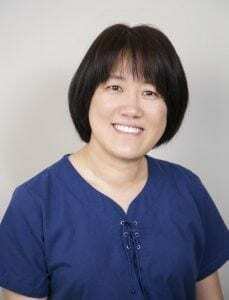 Polly has been trained on pulse dye lasers, CO2, photofacial (IPL), hair removal, excimer, Erbium, Radiofrequncy, NdYag, blue light PDT, Fraxel and Ultherapy. She enjoys the art of fillers and Botox and strives to give her patients the best version of themselves by enhancing their natural beauty. Polly has extensive training with chemical peels, Botox, Juvederm, Voluma, Restylane, Sculptra and Belotero. 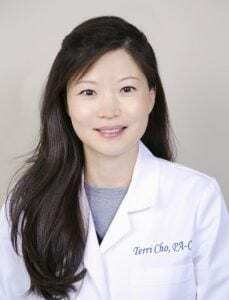 Her professional affiliation include membership in the Society of Dermatology Physician Assistants, American Society for Laser Medicine and Surgery, and the American Academy of Physician Assistants. Polly is licensed to practice dermatologic medicine by The Medical Board of California. She is warm and personable. It is obvious when you meet her, she truly enjoys what she does. Polly makes long lasting relationships with her patients. She likes to spend her free time with her three children and her husband. 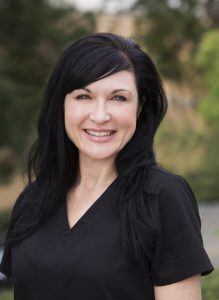 Sandy has been a member of Dr. Sikorski’s staff for over eight years and enjoys assisting her in dermatology and cosmetic procedures. She received her medical assisting certificate from Bryman College in 1996. Sandy received her CoolSculpting certification over two years ago and performs all of the CoolSculpting treatments in the office. In addition to being a medical assistant, Sandy is also a trained makeup artist who enjoys making people feel beautiful. Sandy adds a lovely element to our staff bringing creativity, medical experience, and patient care skills. Eunice is a certified professional coder and has been working as a medical coder. She has medical coding and billing experience in cardiology, internal medicine, and nephrology. She joined the Natural Image Billing department for Dr. Sikorski in 2010. She is detail oriented, accurate, and has a great work ethic. She continues to study to get additional certifications of medical coding. Eunice is also a mother of two teenagers and enjoys spending time with her lovely children.